Jim Richmond asked why his CPU is running at 100 percent, slowing down his PC to a crawl. CPUs, like people, can be overworked. If you've ever been frantically trying to finish an important project while your boss is breathing down your neck about another one, with your phone constantly ringing, and your teenager bombarding you with texts, you know just what a CPU feels like. I can't help you simplify your life, but I can tell you how to ease up your CPU's workload. And that will simplify your life. If an overloaded CPU slowed down your PC once or twice in the last month, don't worry about it. But if it happens frequently--or always--you've got some work to do. Start by scanning your system for malware. Use something other than your regular antivirus program. You probably don't want to install and update software while your PC is slow as molasses, so boot into Safe Mode to do it. I recommend the free versions of Malwarebytes' Anti-Malware and SUPERAntiSpyware. See The Cleanest Malware Scan for other suggestions. Unfortunately, you can't do the rest of these tests in Safe Mode. Well, you can, but they wouldn't tell you anything. When not in Safe Mode, open the Task Manager: Right-click the taskbar and select Task Manager (if you're using XP or Vista) or Start Task Manager (Windows 7). Once it's open you can see how overworked the CPU is without even looking at the Task Manager window. Simply hover the mouse pointer over the Task Manager icon in the Systray or notification area and the status will pop up. 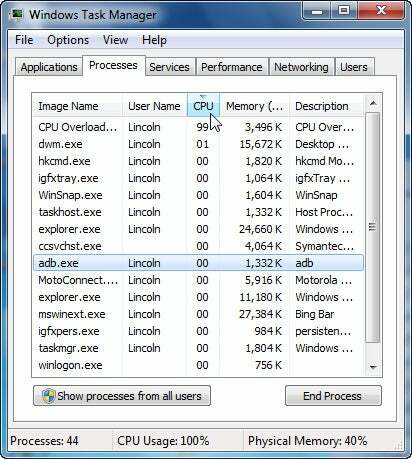 In the Task Manager itself, click the Processes tab. Then click the CPU column heading to sort the processes by how much of the CPU they're using. Whatever process is hogging the CPU will be on top. XP users shouldn't worry about the System Idle Process. In fact, this one should be on top and look like a hog. It shows what percentage of the CPU isn't being used. You can kill a task right away with the End Process button. But that's not a permanent solution. Some program or another is bound to load the process again. But what program? Go to ProcessLibrary.com to get a description of the process. That should tell you which program it belongs to. Once you've identified the application causing the problem, you can check with the manufacturer to see if there's a bug fix, avoid using the program as much as possible, or uninstall it. And if none of these ideas seem practical, consider replacing the program with a competitor.